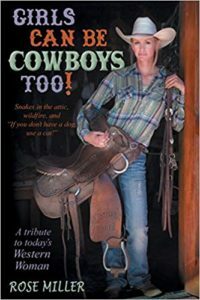 Rose Miller delivers a great read that showcases the unsung hero ‘cowgirls’ of Prescott, Arizona in her latest book: Girls Can Be Cowboys Too! When Miller first moved to Prescott, the transition proved to be a lonely time. She left behind a close-knit family community and their horse farm and traded it for the ‘wilderness’ of Las Vegas Ranch Estates in Prescott, approximately 25 miles north of town. One of Miller’s new doctors, Dr. Heidi Hartman-Taylor, encouraged Miller to make the connection with Kim McElroy, particularly because both women had an innate love for mules. McElroy had cattle which piqued Miller’s interest further as she had a desire to own cattle as well and could use some sound advice on how to get started. As the pages continue forward, Miller steps her audience through introductions of some of the finest, true grit cowgirls with a variety of talents and abilities ranging from cattle ranching, to horse management and breeding, and even to a particular cowgirl who loves to saddle up her bull and ride him. I was immediately intrigued to read and review this story for a couple of reasons: 1) my undying love for horses; and 2) my love of Arizona and its magnificent wide-open western spaces. Miss Miller paints a captivating vision through descriptive detail of the landscape of the high desert of Arizona as much as she pays fantastic homage to the tenacity and endurance of the women (beside their cowboy men). One passage in particular that truly grabbed me was how Miss Miller captured Mary’s (a cook for the Diamond A Ranch) philosophy: ‘Do you ever have a dream or a goal or feel a call in your life? I know I do. I’ve been thinking about what holds us back a lot here lately. Is it fear? Is it that we think it’s just too big and impossible? Do we think that our dreams won’t fit into what other people’s expectations are for our lives? Probably it’s a little of all of those things. All I can say is that not answering that call, not chasing those dreams, not working for those goals will get you to a place where you are bitter and resentful...’ This resonates deeply with me and that is the true essence of what an accomplished writer does: tap into the reader’s emotions purely through sound word placement. Miss Miller has done a superb job in cross-sectioning a diverse group of women in this beautifully written body of work. I am a fan and look forward to her next project. Quill says: Girls Can be Cowboys Too! transcends far beyond the reaches of its subject matter. It is a story full of inspiration and adeptly showcases some pretty darn amazing cowgirls!